We've all been there: spaghetti sauce splattered on the roof, pasta scattered along the kitchen counter top, dishes piling up in the sink and the kids on the verge of opening a hot oven. Chaos reigns. It can be overwhelming running a household, getting meals ready in time, keeping up with culinary trends and still making it to work by 08:00. There's just not enough time in the day to scrub pots, which means that your kitchen ends up permanently looking like a disaster zone. This starts a whole downward spiral because then you don't want to cook in a dirty kitchen—you'd rather just shut the door and order in. The other thing is the abundance of appliances, crockery, cutlery and kitchen utensils that you have in your kitchen. Where have they all come from? What are they used for? Are you meant to whip up a masterpiece with them? Relax. Take it easy. We're here to turn chaos into a cooking-friendly kitchen. First things first, it's time to cull the stock. Unpack every drawer, cupboard and shelf and get to work throwing away the stuff that you don't need. Be ruthless. Think minimalist, where only the bare necessities will survive. Start with the pots and pans. You do not and will never need four of the same size pots. You also don't need a drawer full of lids. Put them in the throw-away pile. Then go through your utensils, sifting out the old ones that have lost their colour from the newer, more shiny ones. A dozen knives and forks are more than enough. If you have more than 12 people at your house, you can always purchase some plastic cutlery and plates. The crockery is next—throw out any chipped plates or cracked bowls. They do nothing for your décor or design scheme and bring the whole style of your kitchen down a few notches. You do not need them. If you find that most of your kitchen crockery, cutlery, pots and pans are old then get rid of the lot. It's the perfect time to ask for a new set of plates or bowls for Christmas. Just make sure you go for quality over quantity. You can also recycle your old stuff by donating it to a charity. The perfect space to cook and create is a space that is clean. Imagine an artist's blank canvas and the power and opportunity that it holds. An artist can't get to work on a canvas that has a mess all over it. Clear your counter tops, packing away glasses, condiments, fruit bowls and any other unnecessary kitchen goods that litter the room. Fruit can go in the fridge, glasses and condiments in the cupboard and anything else can be stacked on shelves or thrown away. If your kitchen is spotless, you'll are more likely to feel inspired, creative and keen to roll up your sleeves and get cooking. Having a breakfast bar or island in the kitchen is also a great way to keep the kids close to you, without them cramping your cooking style. They can do their homework on the other side of the breakfast bar without getting in your way or messing up your perfectly pristine kitchen. You know that pantry that you've been avoiding sorting out for years? Well, there is flour in there that expired in 2012 and icing sugar that has gone hard. It's time for a clean out and some re-organising. Tupperware is one of the best ways to organise shelves and cupboards, creating a neatly categorised space. Order a set of different types of Tupperware and label them according to what they will be used for such as pasta, sugar, flour, bread, rice etc. Then decant all of these into the labelled Tupperware. This will prevent you from having packets and packets of the same ingredients or staples turning rotten at the back of your cupboard. It also keeps them fresh in the air tight containers. Your kitchen shelves and cupboards should also reflect a bare necessities approach so keep a regular eye on it, doing a full clean out every few months. When it's easy to find what you're looking for, you'll be more likely to cook. A kitchen should be a happy place, filled with light and laughter, along with good smelling food. Light can be achieved in a variety of ways, without making the chef feel like they're on a stage under a hot spotlight. For example, this kitchen and dining room, by Schmidt Holzinger, is filled with beautiful light both from natural and artificial lights. Natural light is easy to bring into a kitchen by ensuring doors and windows are not covered by curtains or blinds. You can also build a gorgeous skylight into your roof, allowing sunlight to filter in from the ceiling. This not only creates a warm space but it allows you to see what you're doing when you're chopping those onions into fine little pieces. 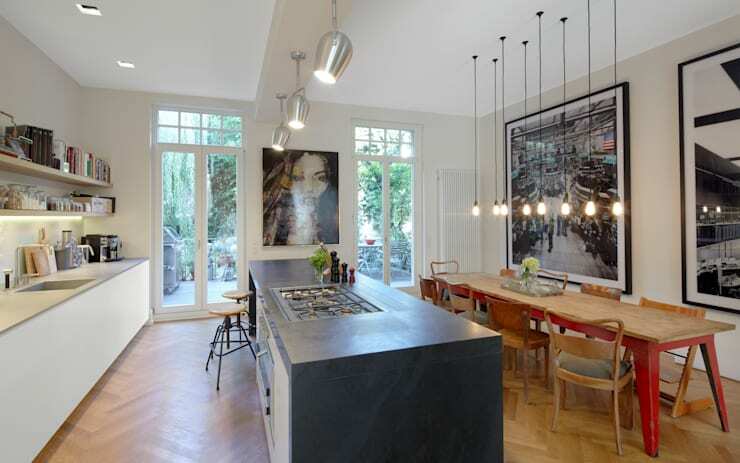 Artificial light can also add some trend and style to a kitchen space, illuminating your cooking space. 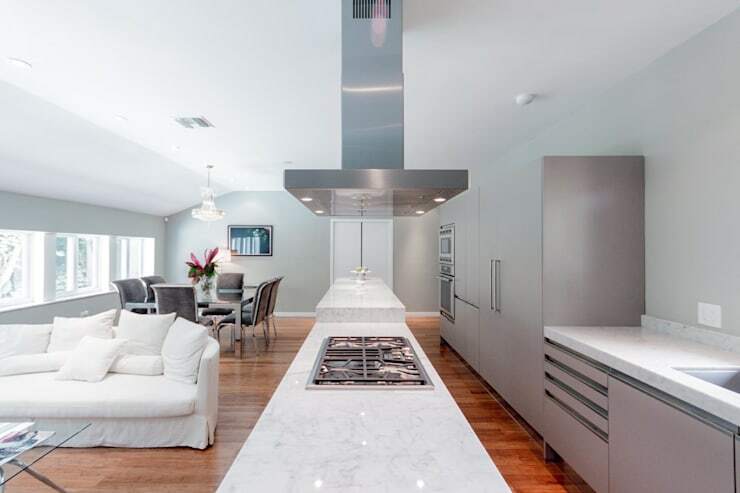 These fabulous spotlights in this particular kitchen, for example add a sleek and modern touch to the kitchen while providing bright lights for concentrating on your cooking. Recipes and cookbooks are an important part of the kitchen space—it's from where you draw inspiration and learn how to create new dishes. 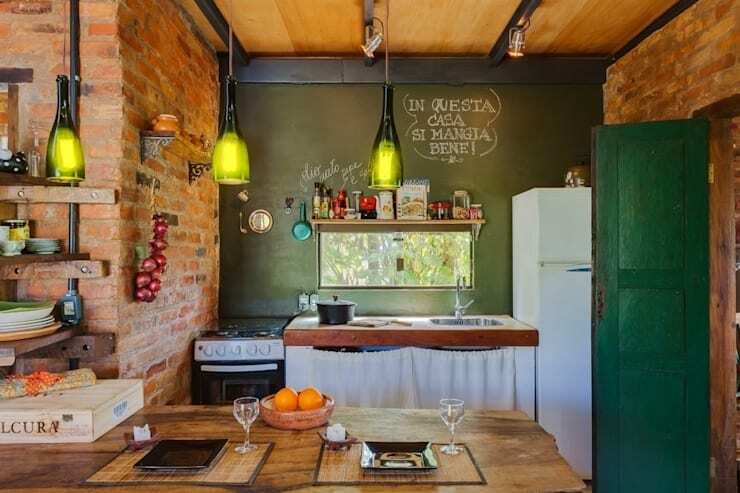 Having your recipes and cookbooks in the kitchen can either add clutter and mess or add colour and style. You want to go for the latter. Opt for a bookshelf where you can neatly store all of your recipes and cookbooks. Colour-code them or categorise them according to alphabet, food-type or theme. That way they will be easy to find and your favourite recipes will be at hand at all times. Smart storage is the way to go when it comes to the kitchen. 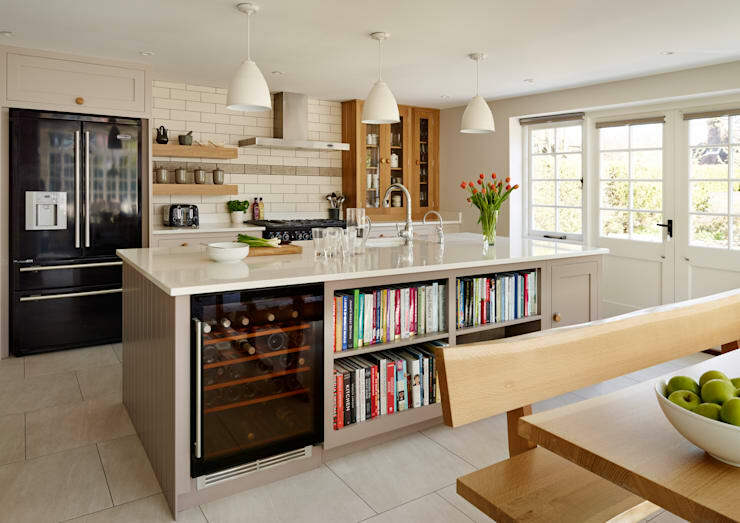 Opt for shelves that utilise vertical spaces or cupboards under the kitchen island. You also want these areas to be bright and colourful so add a few candles or an ornament or two to spruce up the shelf. 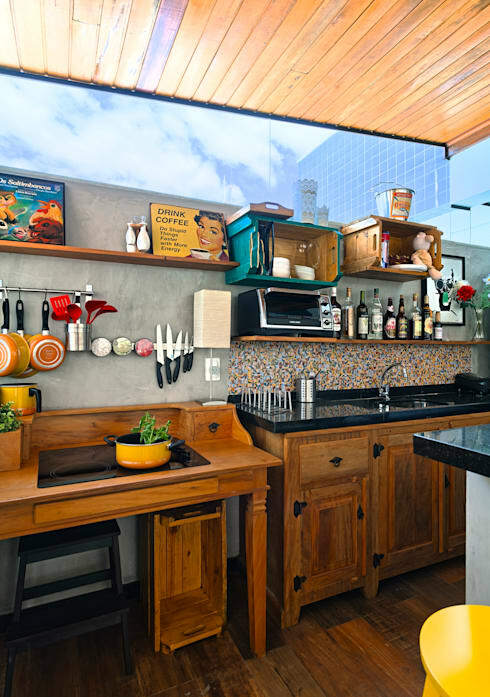 When kitchen materials and tools are easy to reach, cooking becomes a breeze. There's nothing worse then having to move a stepladder into your kitchen every time you need to use a spatula. Put gorgeous racks up where you can hang pots and pans so you don't have to dig through the drawers every time you need to make some rice. These can also add a colourful and stylish feature to the kitchen. Make sure your most important materials and tools are also in the lower drawers and cupboards so you don't have to reach up high every time you need to use them. Rather stock less important materials and tools higher up that you don't use as often. The kitchen should be a place where magic happens, where your children get their first experiences of licking the spoon while making a cake and where you imitate your mother's famous chicken roast. Say no to chaos and say yes to creative cooking. Want to try out your new, inspired cooking skills? Advice for Hosting A Housewarming Party To Remember, no matter how long ago you moved in! Is your kitchen a disaster? Or perhaps it's a chef's delight? Share you experiences with us in the comments!